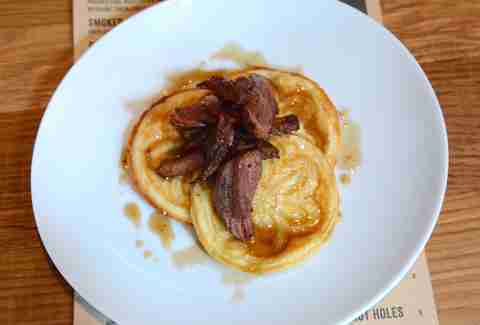 Hide your vegetarians, because The Partisan just launched a brunch that’s meat-blasted with everything from face bacon to foie gras. Here are seven things you’re ordering at the Penn Quarter restaurant Saturdays and Sundays from 11am-2:30pm. 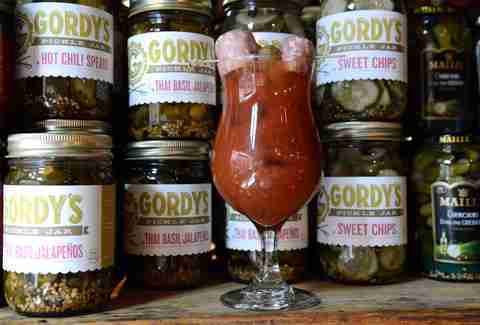 Start by prepping your belly with The Partisan’s Bloody Mary made with a zippy mix from local company Gordy’s Pickle Jar. The bar team sets the tone for your imminent nose-to-tail brunching experience by garnishing the Bloody with Red Apron’s signature half-smoke. At first glance, this looks like an innocent enough start to the day, but dig one forkful deeper and you’ll happen upon buttery morsels of foie gras. Say "I deserve this," as you continue excavating duck confit coated in red wine duck jus. 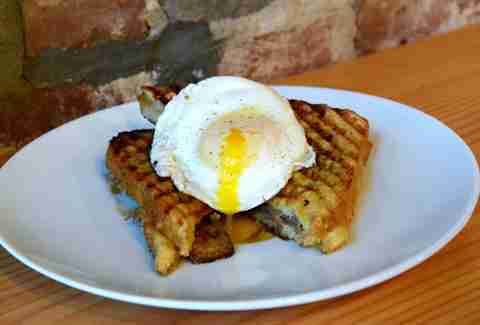 This gooey, fried egg-topped health concern has been the biggest seller since brunch launched, so order it to see what all the fuss is about. Because canola is for chumps, Chefs Ed Witt and Nathan Anda aim to fry just about everything in beef fat. 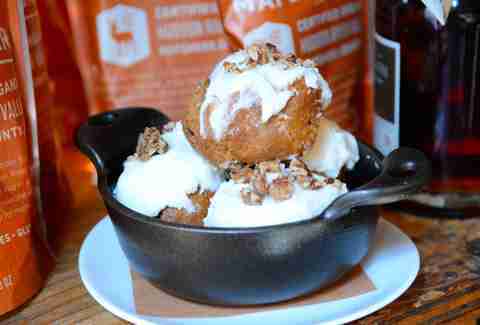 These carrot cake donut holes are no exception. The batter for these bad boys is made the night before to allow them to rise to the size of billiard balls once they hit the fryer. Of course they’re coated in cream cheese icing and pecans. Eat them the second they arrive to avoid a bad memory of 5th grade when the fat kid brought in cold, hard Munchkins for his birthday and then didn't share. Two patties is not enough when you’re recovering from a happy hour that turned into closing down the bar. Enter The Partisan’s Triple Stack Burger that marries two beef patties with one breakfast sausage patty in a polygamous patty party you won’t soon forget. 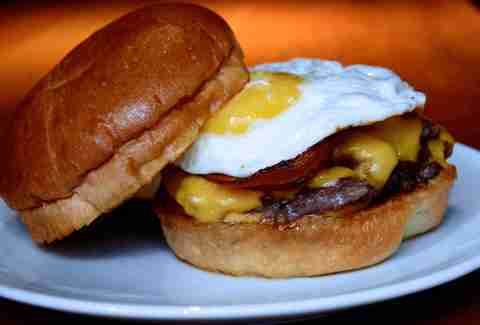 Adding to the decadent hangover cure is American cheese, bacon, a fried egg, and maple butter. You’re welcome to prove us wrong, but we think this is a knife-and-fork situation. Just in case you need MORE bacon, there’s a sharable bacon plate that true meat bosses will treat as a breadbasket. 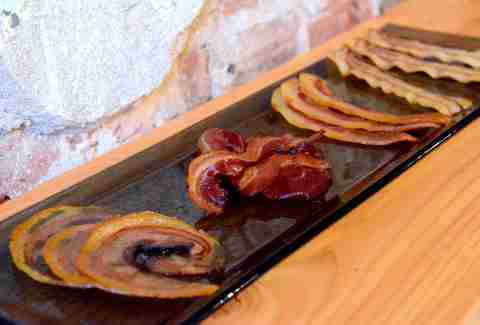 It features French-style ventrèche rolled with black pepper; The Partisan’s house bacon; face bacon cured with ginger, cayenne, and long peppers; and a flat pancetta called tesa. It’s a gift from the charcuterie gods that’ll leave you feeling like you’re wearing bacon lipstick. If a Bloody Mary doesn’t do it for you, several original brunch cocktails are on offer, like the "Cool Confusion," with Fords gin, Amaro Abano, lime, and ginger beer. 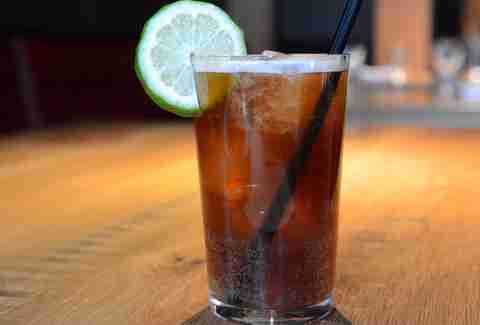 It’s refreshing and cuts through the fat -- however, it also costs $13. 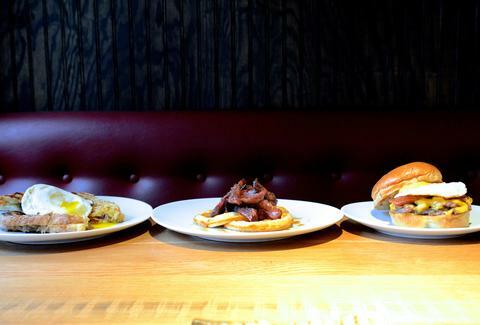 Fortunately, The Partisan’s brunch menu pairs exceptionally well with craft beer. Consult the beer list divided into four helpful categories: crisp, hops, fruit + spice, and tart + funky. Repurposing The Partisan’s signature bread for pancakes is as natural as maple syrup. The Italian-style rounds, called tigelles, are glutinous and absorbent -- which is important, since they’re responsible for soaking up a maple-bourbon reduction. Sure, there’s an option to get these pancakes with whipped ricotta and fruit, but you’re ordering the set that comes with pulled pork.